If, like me, you are a big fan of this genre of books then like a fluorescent monkey trapezing through the aisles of lidl, this book has been hard to miss. 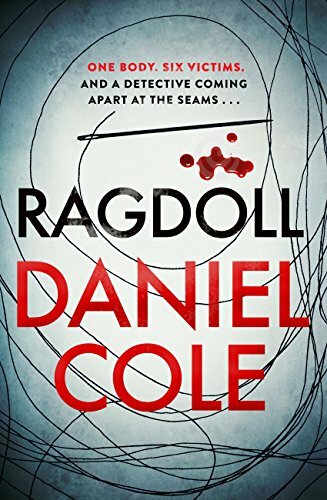 I first read about Daniel Cole in this article from the Telegraph in April of this year And like a obsessive stalker have been on the lookout for this book ever since. Not another crime book hyped up to reel us in only to let us down with plot holes bigger than Watford gap with convoluted characters who we couldn't give a damn about I hear you say. Well no. Nope not here. With this Book we have ourselves a genuine contender for book of the year and with it a truly great story teller in Daniel Cole. My personal favorite Author is Chris Carter and at last the UK has found an author who can stand shoulder to shoulder, toe to toe and any other bodily part with him. The story itself is a wonderful, full on, catalogue of everything a book of this genre should be Its full of suspense, horror, gore and tension all topped off with a splash of humor. Like all fictional detectives Wolfe is a man with a history and has to face his own demons as well as solve the case. He is surrounded by a plethora of characters that all play a part in the story and you never quite know what their intentions are. The villain of the story is a fantastic creation but the question I asked myself at the end was who is the real villain of the book? The last book that had me this enthused was Tom Bales See How They Run and as I did with that book, I will be buying copies of Ragdoll to give to my friends and family. This has been the only book I have ever read twice back to back. A truly great book.